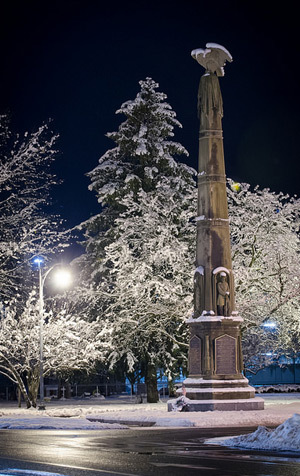 The monument located near City Park at the intersection of Bay and Glen Streets was constructed in 1868 by R.T. Baxter and cost a total of $12,000. It was built to honor the 644 Queensbury men who served in the Civil War from 1861-65, including the 95 who lost their lives. The sandstone marker was officially dedicated in May 1872. Although it was located within Queensbury's boundaries at the time of its construction, the monument became the property of the City of Glens Falls when the municipality was officially chartered in 1908. The monument has undergone multiple restorations over the years, including an extensive one that was completed in 1999. As part of the project, the sandstone eagle that adorns the top of the marker was replaced with a terra cotta replica, which is better able to withstand the elements. During the 1990's project, an additional bronze plaque was added to the monument containing the names of thirteen soliders who were inadvertently left out during its initial dedication. Funds for the restoration were raised by the Adiriondack Civil War Round Table's Soldiers' Monument Restoration Committee. Minor maintenance was performed in 2011 to clean and restore the monument, as well as add another soldier's name.